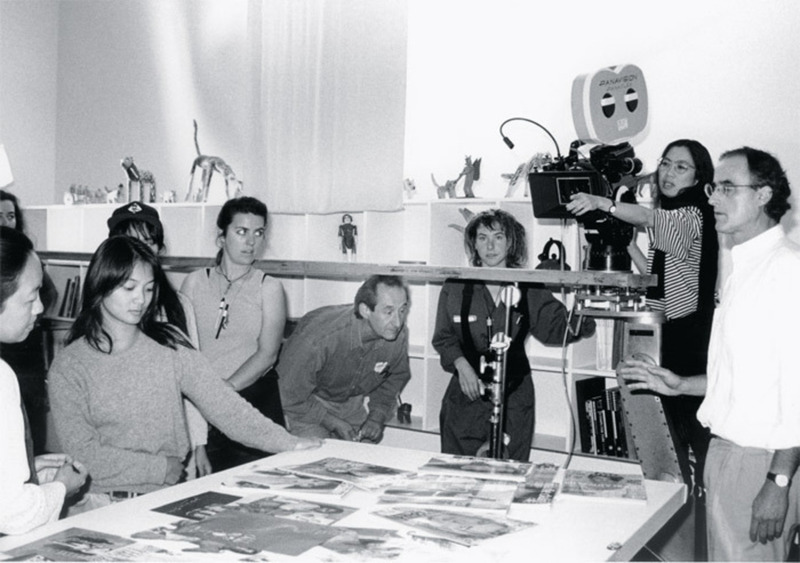 Trinh T. Minh-ha (with camera), codirector Jean-Paul Bourdier (right), and crew on the set of A Tale of Love, 1994. Moon Gift Films, 1994. Collaborative and collectivist practices have historically enabled alternative modes of subjectivity; in the best case, they promise to open up divergent routes of being-with-others while subverting the ruling regimes of visibility and representation. Such aspirations made them central to the many feminist, queer, postcolonial, and antiracist cultural practices that became more and more active and visible in the 1970s and ’80s, accompanying the rediscovery in those years of the historical avant-gardes, from the Fauves to Dada to Russian Productivism. Self-organized, alternative spaces, co-op galleries, etc. also emerged on the grounds of new insights into asymmetrical power relations. Along similar lines, Vietnamese filmmaker, writer, and theorist Trinh T. Minh-hawho in her own practice has always dealt, if implicitly, with the relations between collectivities, constituencies, and subjectivitieshas pointed out that the “tendency to value collaborative work over individual work [occurs] in contexts where it is almost impossible to escape the burden of representation.”³ As examples of groups in which “a certain rejection of individual authorship may thrive,” Trinh mentions the UK film groups Sankofa and Black Audio Film Collective (BAFC). Shedding light on another aspect of collective practice, John Akomfrah, a cofounder of BAFC, in 1983 stressed its importance as a strategy to “demystify . . . the process of film production”; moreover, his hope was that it “would also involve collapsing the distinction between ‘audience’ and ‘producer.’”⁴ According to this view, which harks back to Constructivist and Productivist models, collectivity becomes a methodology for transforming both the reception of an artwork and its production. It’s not surprising that film, as an inherently collaborative mode of cultural production, features prominently as a medium of collective artmaking from the margins. Nevertheless, as Trinh also argues, many groupsparticularly those that act as collectives of productiontend to organize themselves hierarchically in spite of themselves, granting leadership to whomever has the most compelling plan or vision (or, simply, whomever has more social or economic power). In consequence of this and other caveats, she rethinks the notion of collaboration, proposing that it “happens not when something common is shared between the collaborators, but when something that belongs to neither of them comes to pass between them.⁵ The something-in-between she describes could be defined as the contingent product or outcome of a given collaboration that retroactively emerges as constitutive of the shared project or enterprise. As Trinh sees it, collaboration is thus essentially unintentional; it cannot be planned or anticipated. 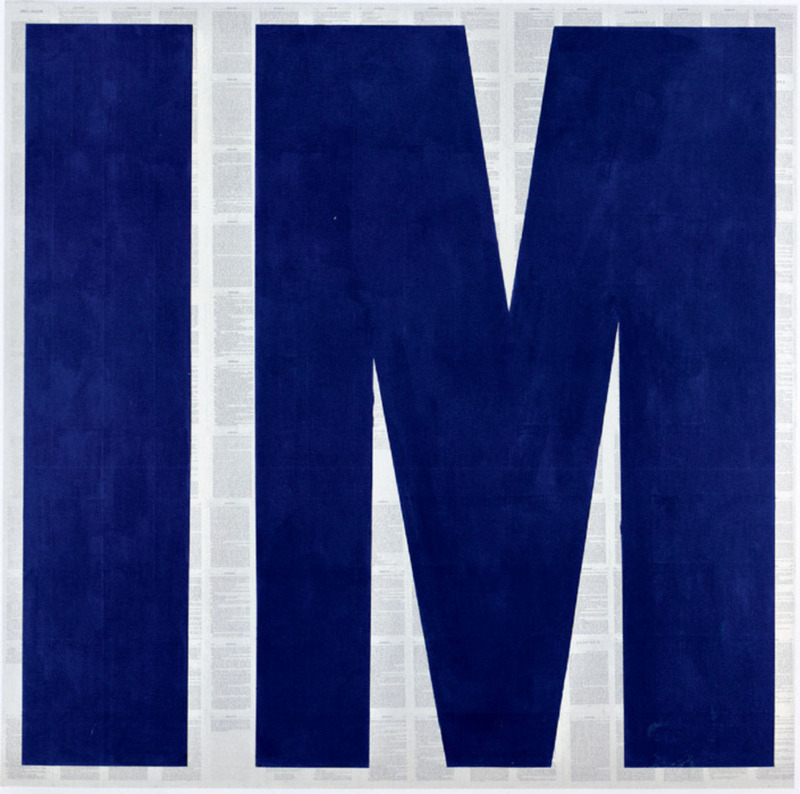 Tim Rollins and K.O.S., Invisible Man (After Ralph Ellison), 2007, acrylic on book pages mounted on canvas, 72 x 72". The nostalgia for rare, bygone moments of collective accomplishment still feeds a hope of overcoming, if only temporarily, prevailing patterns of depoliticization. Yet we must remember that each reinvocation and resignification of collaboration and collectivity, as well as any corresponding (self-)criticism, is a response to mutations of the spaces of the political and the possibilities of articulation within and beyond these spaces. One of 16 Beaver’s founders, the artist Rene Gabri, explains why collaboration should not be thought of outside present political upheavals: “I cannot think of new artworlds . . . without implicitly thinking about new worlds.” Arguing that practices that are considered collective, social, collaborative, or participatory often “do more to hide differences and disagreement than they do to confront or reveal them,” he speaks of the collectivity we now need as having to offer “something beyond the kind of social cooperation we have been presented under capitalism.”¹⁵ Collaboration is in danger of losing its disruptive potential, since the novel forms of subjectification it nurtures have either been co-opted already or are at risk of being so: It is the “terms,” as Gabri puts it, and not the mere fact of cooperation, that are today at stake. To find feasible ways of teaming up and working togetherways that go beyond those by which individuals continually and inevitably contribute to and cooperate in culture todayrequires a double move: It demands both an acute awareness of the abstract logic that determines the constant appropriation of social and psychic energies by capital, and a willingness to engage with the concrete micropolitics of material, social practices whose outcomes are often unintentional and can never be predicted. In other words, cooperation is a kind of ethics. Now it needs to be wrested from the historical conditions that have given it its shape. Tom Holert is a professor at the Academy of Fine Arts Vienna. Black Audio Film Collective, Signs of Empire, 1982–84, still from a black-and-white and color slide projection with audiotape transferred to video, 22 minutes. 1. Mira Schor, “On Creativity and Community,” M/E/A/N/I/N/G 15 (1994), reprinted in M/E /A/N/I/N/G: An Anthology of Artists’ Writings, Theory, and Criticism, ed. Susan Bee and Mira Schor (Durham, NC: Duke University Press, 2000), 337. 2. Irit Rogoff, “Production Lines,” Team Spirit, ed. Susan Sollins and Nina Castelli Sundell (New York: Independent Curators Incorporated, 1990), 39. Accessible online at collabarts.org/?p=69. 3. Gwendolyn Foster, “A Tale of Love: A Dialogue with Trinh T. Minh-ha,” Film Criticism 21, no. 3 (Spring 1997), quoted in Trinh T. Minh-ha, Cinema Interval (New York: Routledge, 1999), 244. 4. John Akomfrah, “Black Independent Film-Making: A Statement by the Black Audio Film/Video Collective,” Artrage: Inter Cultural Arts Magazine 3/4 (Summer 1983): 29, quoted in Manthia Diawara, “Power and Territory: The Emergence of Black British Film Collectives,” Fires Were Started: British Cinema and Thatcherism, 2nd ed., ed. Lester D. Friedman (London: Wallflower Press, 1996), 129. 5. Quoted in Trinh, Cinema Interval, 244. 6. 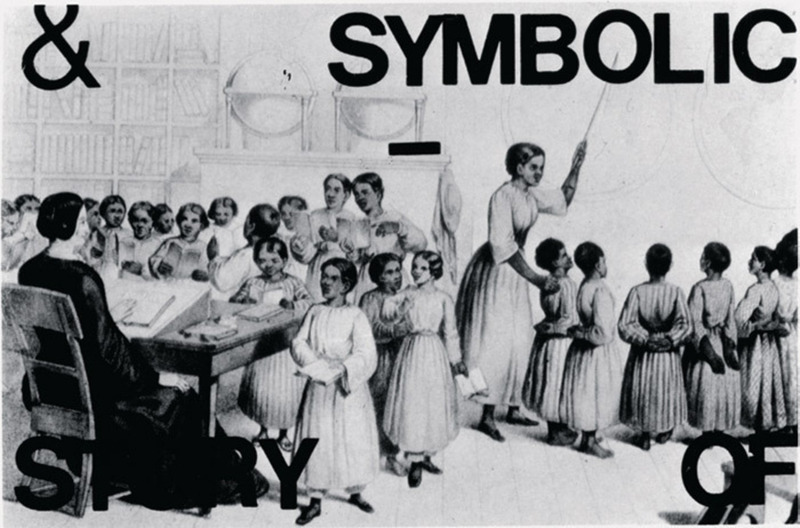 Martha Rosler, Documenta 7, exh. cat., vol. 2 (Kassel: D+V Paul Dierichs, 1982), 284. 7. Josef Strau, “Friesenwall 120,” Texte zur Kunst 2 (Spring 1991): 174–75. 8. Trebor Scholz, “The Participatory Challenge,” DATA Browser 03: Curating Immateriality; the Work of the Curator in the Age of Network Systems, ed. Joasia Krysa (New York: Autonomedia, 2006), 195–213. 9. Nicolas Bourriaud, Esthétique relationelle (Dijon, France: Les Presses du réel, 2002). 10. Grant H. Kester, Conversation Pieces: Community and Communication in Modern Art (Berkeley: University of California Press, 2004). 11. Johanna Billing, Maria Lind, and Lars Nilsson, eds., Taking the Matter into Common Hands: On Contemporary Art and Collaborative Practices (London: Black Dog Publishing, 2007). 12. 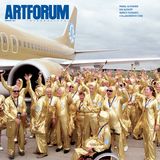 Claire Bishop, “The Social Turn: Collaboration and Its Discontents,” Artforum (February 2006): 178–83. 13. Blake Stimson and Gregory Sholette, introduction to Collectivism After Modernism: The Art of Social Imagination After 1945 (Minneapolis: University of Minnesota Press, 2007), 13. 15. Rene Gabri, “Postscript from Rene,” in Billing, Lind, and Nilsson, Taking the Matter into Common Hands, 127–28.